Twisted pair Ethernet (10 and 100 Mbit/s) uses two pairs of wires. Ethernet (10 Mbit/s works well, 100 Mbit/s sometimes) can be run on the old telephone wiring. There some years ago quite a bit of interest in reusing old telephone wiring for Ethernet connections. Reusing old installed wiring for Ethernet works usually well if the cable has suitable for the application (specifications near to CAT3 or better) and there are free cable pairs to use for Ethernet. What if there are no free pairs. Problem is that of the 1980s and early 1990s, blocks of flats. These are only a 2-pair MHS 1 x 4 x 0.5 telephone cable. An easy solution would be to abandon landline phones altogether, and the whole cable for Ethernet. Especially mobile phones have replaced landlines on rented houses. All may not be to abandon a fixed phone. Therefore a need for a solution for 10Base-T Ethernet to run the same two among POTS phone at the same time. In this solution, Ethernet is places on on two telephone cable wire pairs normally. Phone Signal is connected between pairs so that the two phone wires connect together Ethernet-pair wire. Connection on both ends there is a separation filter. In my opinion, mainly inside the box a couple of capacitor, which prevents the phone high DC voltages migration of Ethernet devices. There seems to be available some more information on etherSPLIT still on-line at etherSPLIT secrets discussion where I and the original inventor took part. Not a balun, not a frequency splitter. As for its uses it is used for retrofitting existing properties. Utilitizing existing copper that cannot support 100+ megabit speeds with standard ethernet. And using existing two pairs to split to three pairs using standard ethernet hubs/switches and no extra power supply needed. Apartment complexes, hotels, and cruise ships have all been installations for this product. As for every electrical engineer that has seen the circuit, there first response is “it can’t work”…. “well, maybe”…. “damn, that’s clever”. Besed on the information on the discussion it seems that this etherSPLIT could use techniques similar to used to make Phantom circuit and to run Power over Ethernet over same pair as data. EtherSPLIT Installation Instructions and Wiring Diagrams document says that etherSPLIT will NOT function properly with 10/100Autosensing Switches/Hubs. Be sure to use ONLY10BaseT Switches or Hubs. In the discussion 10Base-T Ethernet puhelimen ylätaajuudelle (translated to English) there was talk about another idea idea for running Ethernet signal and telephone signal on the same wire pair in a similar ways as ADSL and HomePNA signals are run on the same pair with the analogue telephone: frequency division multiplexing. The ADSL signals run on the high frequencies (tens of kHz to 1-2 MHz), while analogue telephone runs on low frequencies (0-3.5 kHz). Those can be separated from each other with quite simple low pass (ADSL filter for telephone) and high pass filtering (capacitor in ADSL modem input circuit). The Ethernet signals are in the same way at considerably higher frequency (main energy between around few hundred kHz and 10 MHz) than analogue telephone signals, so the same kind of filtering might work here as well. High frequencies are filtered thus telephone branch is connected through standard ADSL / HomePNA “Micro filter” filter. The filter must be placed close to the branch point to telephone line, to avoid signal reflections. Balanced by the post and 20Hz ringing frequency getting to Ethernet branch must prevent. This capacitor is apparently sufficient to distinguish between an Ethernet branch and telephone line. – What is a suitable capacitor? – What is the voltage required for the duration? The following ASCII graphic is a picture of the apartment passing switch Ethernet-pair wiring. In the opposite direction the Ethernet traffic is telephone cable to a free people without Any Of ylimäräisiä connections. I did some tests on this when I read this article and posted a reply where I told on my results. Quick test on capacitor values: I had the PC with 10 Mbit/s Ethernet card. I put the signal to go in the past 10 nF capacitor (size I calculated to be OK, more than 4.5 kohms at telephone frequencies and few ohms at few MHz) through. Ethernet connection seemed to go well at least on short cables. For initial tests I used just small 470 microhenry coils as filters for the telephone line side (10 ohms or less at telephone frequencies, few kilo-ohms at Ethernet frequencies). Those coils gave enough isolation so that the Ethernet worked well, but those might not meet all of the telephone regulations. I used normal telephone line and telephone central simulator on line ends on my tests (I did not connect to public telephone network). 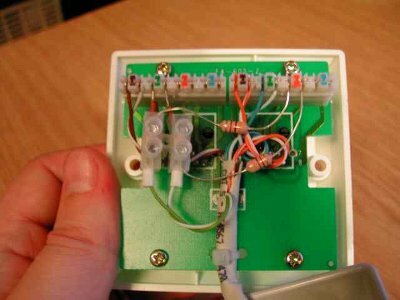 Here is a picture of the prototype inside dual RJ-45 wall socket (Ethernet on left and phone on the right) with capacitors and filter coils. I built two of those, and then run Ethernet and telephone line through the system. One direction of Ethernet shared the wire pair with telephone line (though those capacitors), the other direction went straight though on it’s own pair. Things seemed to work well on 10 Mbit/s Ethernet speed. I even tested by having 100 meters of CAT5e cable between those outlets, and Ethernet seemed to work (I also tested on some other cables). Seemed to work on ping tests and normal web surfing. And using the phone did not seem to have effect on the communications. Things seemed to work well at 10 Mbit/s (but not that reliably at 100 Mbit/s). To the capacitor voltage ratings next. In my prototype I used 250V 10 nF ceramic capacitors. Those were about 1 cm diameter disks. Those were easy to fit inside RJ-45 wall socket. A 500V version of the capacitor would be a little bit bigger. The question is what would be the needed voltage rating for those capacitors? I don’t really know. Would we need something like 1-2 kV capacitors to be on safe side, or would just a lower voltage do because Ethernet cards have 1500V isolation in them (comparable to minimal isolation needed on telephone line modems). The ends results was that running Ethernet over the same pair with analogue telephone circuit could work at 10Mbit/s. In theory it could work, and in practice it seemed to work on laboratory conditions as well. The next plan at the time was maybe to test that in real-life conditions and looking more at the technical regulations that needs to be met (voltage ratings, protections, EMC etc..), maybe explore how well the commercial ADSL splitters will work on this. There were ideas at the time, but I did not have enough interest and needed time to push this idea more. Maybe it was good that I did not spend more effort on this, because the time just got past to this kind of hacks that are pretty much limited to 10Mbit/s speeds. Also in next years the demand for analogue telephone seemed to drop when everybody seemed to want mobile phone and not the traditional phone line (especially those ones who wanted fast Internet connection). Also operators started to offer reasonably priced fast Internet connections (ADSL 8-24 Mbit/s, sometimes even faster with fiber to house and VDSL to apartment on free wire pair). So this hack was a solution that was not widely needed, and soon 10Mbit/s Internet connection which this kind if hacks were pretty much limited did not feel to be very fast anymore. am a user of net thus from now I am using net for articles, thanks to web.